Writing script in the Copperplate style using a flexible pointed can be a daunting task. One of the reasons for this difficulty is using an oddly shaped pen staff known as the oblique penholder (Figure 1A). For the novice this 'tool' can seem as mystical as a wizard's staff. In fact, the oblique penholder aided the development of the modern day Copperplate styles of script. Unfortunately, a poor quality or improperly adjusted oblique penholder has caused many a calligrapher to give up on the pointed pen style or greatly limited their progress. In this article I will try to demystify the oblique penholder and explain why it is so successfully used for script writing. Let us first examine what happens when pressure is applied to a flexible steel pen (nib). It should be noted that all shades are formed using down strokes of the pen. As your hand exerts downward pressure on a flexible nib such as the Gillott 303, both the left and right nib tines will spread apart laying down more ink to create a shade (Figures 1B, 1C). I will refer to the width of a shade as heft. Increase or decrease the pressure and you increase or decrease the heft of the shade accordingly. In addition, the overall slant angle of the letters can vary from ~45°-55° or more depending upon the style of script and personal preference. The two factors, shading and slant angle, combine to give rise to problems when a right-handed calligrapher attempts to write shaded script using a flexible nib and a straight pen staff. Walt Disney once said, "Every line has two edges." This statement is especially important when considering a shaded line of significant heft. When a right-handed calligrapher uses a straight penholder and attempts to write script at the angles mentioned above a curious thing happens. As the nib tines spread and the pen moves across the paper, the right nib tine will tend to drag across the paper leaving a ragged edge on the right side of the shade (Figure 1B). This happens because the long axis of the nib is far off the main slant angle of the shaded stroke. It should be noted that this 'ragged edge' is not necessarily a negative since France's Jean Larcher uses this ragged edge to great effect in his wonderful script. Many left-handed calligraphers do not face this issue when using a straight penholder since their pen position usually, but not always, accommodates the slant angle. However, it is worth noting that most 'lefties' that I know who are very proficient in script use an oblique penholder, including master penman John DeCollibus of Southboro, MA. In order to get both nib tines to move smoothly over the length of the shade, the long axis of the nib should be on or very close to the main slant angle of the shade (Figure 1C). There are a few ways to accomplish this. One way to properly align the nib tines would be to use a straight penholder and modify your hand and/or the paper position to facilitate making a smooth shade. I do not recommend this approach since this will place your hand in a very awkward writing position. A better approach is to mechanically angle the nib relative to the pen staff. This could be accomplished in one of two ways. First, nib manufacturers such as Gillott produced a flexible steel nib with an elbow bend for use in a straight penholder (Figure 1D). These 'Elbow' nibs have been used effectively by many calligraphers. However, they do not allow adjustment of the pen angle relative to the pen staff to accommodate an individual's personal writing style. The solution, and the approach embraced by past masters of the pointed pen, was to modify the pen staff itself with an obliquely positioned flange (Figures 1A and 1C). The flange, usually made of metal, positions the entire nib at an offset angle relative to the long axis of the pen staff. This eliminated the dragging of the right nib tine across the paper. Smooth edged shades were now possible since the nib is on or closely approaching the slant of the shaded stroke (Figure 1C). The earliest patent I have seen on this important tool was from England by Morden and Brockedon in 1831 (Sull). The placement of the nib in the flange is also important. 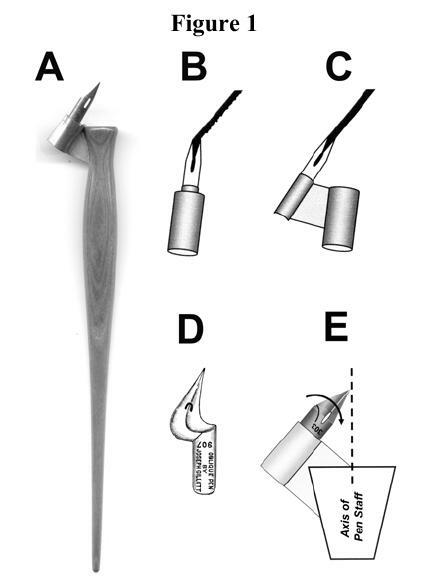 The nib should be inserted into the flange so that the very tip of the nib is in line with the long axis of the staff of the pen as shown by the dotted line in Figure 1E. While some pen artists may prefer slight variations, a nib that has its tip positioned too far off the indicated dotted line in Figure 1E will feel unbalanced when writing. The following pen holder adjustments that I will discuss here are accommodations to the modern day pen grip. The penmen/calligraphers of the golden age of American ornamental penmanship were taught to hold their pens in a different fashion. However, that subject is beyond the scope of this article. Most modern premium oblique penholders, like their vintage counterparts, have a metal flange that can be adjusted to better accommodate one's own style of holding the pen. If the long axis of the nib, when viewing the pen from the side as shown in Figure 2A is the same as the long axis of the pen staff the nib-to-paper angle will be steep when writing. This could result in difficulty writing, excessive nib 'scratchiness' and ultimately frustration. The solution is to bend the nib/flange assembly so that the tip of the nib is positioned slightly upward. 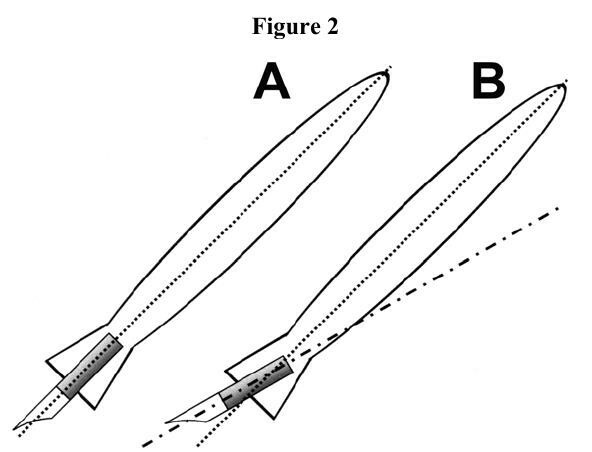 The result is a less steep nib-to-paper angle (Figure 2B) when compared to the unmodified holder held at the same writing position (Figure 2A). This will help facilitate writing and the nib should glide of the paper with much less difficulty. The final adjustment is to cant the nib/flange inward slightly as indicated by the curving arrow in Figure 1E. This adjustment allows both nib tines to sit equally on the paper as the hand rotates down into the writing position. This adjustment is important since good writing is next to impossible when only one of the two nib tines is making contact with the surface of the paper. Ok, so you just purchased a premium oblique penholder and you’re still having a very difficult time writing. While there could be many reasons for this, such as a bad nib, poor paper, etc., for the purpose of this article we will focus on the penholder. A question that should be addressed, "Does purchasing a premium oblique penholder insure that the holder will be properly adjusted right out-of-the-box?" The short answer to that question is a disappointing no. Of course, there are exceptions such as the holders sold by master penmen such as Mike Sull (Figure 1A). These holders are handcrafted with custom fitted flanges that are properly adjusted before being sold. The good news is that the metal flange of most quality penholders can easily be bent/adjusted using finger pressure. First, insert a nib into the flange then align the tip of the nib with the center of the pen staff as shown by the dotted line in Figure 1E. Next gently bend the nib/flange assembly upward and slightly inward as described above. The angles should roughly correspond to those shown in figures 1E and 2B. Once the desired angle is achieved be sure to re-align the nib tip with the center of pen staff. Remember that these adjustments are meant to accommodate your hand. You will need to experiment to find the angle that best fits your hand. The instructions above will provide you with a great starting point. For those wishing to explore the images of modern and/or vintage oblique penholders please visit Zanerian.com (http://www.zanerian.com).